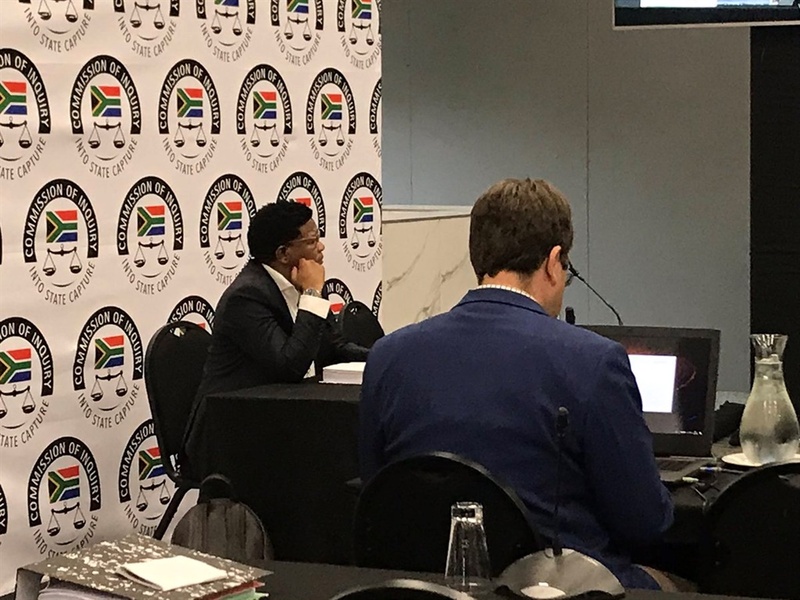 Former minister of sports and recreation Fikile Mbalula testified before the Commission of Inquiry into State Capture in Parktown, Johannesburg. The commission has now adjourned and will resume on Monday. The DCJ is grateful the former minister came through, and asks for more past and present to come forward. Mbalula says its never been his intention to undermine the commission, he is okay with people coming to challenge his testimony, he's sure of what he was saying, he says they had skirmishes with the commission people. Mbalula: when it was leaked to the press not all issues were articulated as they had happened in the meeting, they simply said Mbalula was offered a position. Stubbs wants him to also clarify what "it", "cowards" and "elephant in the room" comments are: that NEC meeting - Mbalula says people were raising the issue - speaking and praising him in corridors and leaking info to press instead of discussing it. Gcabashe is done, Mbalula's council gets up and raises two issues before the DCJ. Asked if he has personal knowledge of undue appointments. Mbalula says he doesn’t know. He says he doesn't want to give information he can't support. Mbalula: I was congratulated by Ajay Gupta for going to become minister of sports and recreation. Mbalula insists that he was appointed by the president. But goes into a conversation with the Guptas that he would be the minister of sports, and relayed it to PP. Zondo interjects that a call is also considered being contacted. Mbalula says he is here about what Nyanda and Manuel said happened in the NEC. Gcabashe tells the DCJ she doesn't think she wants to take this matter any further. Mbalula says his frame of mind at the time of dealing with the PP - he stuck with his notion that the president appointed him, and not the Guptas. Mbalula: I never had a conversation with Mr Ajay Gupta about the post of minister of sports and recreation. -In a 2016 interview with PP. Evidence is now contradicting his previous statements. Mbalula says the transcript of the Public Protector (PP) does not reflect on the revelation he made at the NEC meeting. Mbalula is now being questioned about contradicting statements made to the PP. Mbalula says he made a political statement about the Guptas. Mbalula saying he's not confused about the brothers' names cause Ajay Gupta introduced himself. Mbalula says he ate the curry, doesn't recall if its vegetarian now, but because they told him everything there came from their farm he assumes it was. Mbalula: Ajay Gupta offered me curry at his house. But that curry never finished me, I stood firm. Gcabashe says Mbalula's statement conflicts that of Ajay Gupta, which states that he was at Sahara Computers when he congratulated him. Gcabashe: Did it cross your mind at all that it might have been (former) President Zuma who had discussed the issue with Ajay Gupta? Mbalula says it could be Zuma or any other person. He says he doesn’t want to speculate. Mbalula says it would be easy to get his number & that Ajay Gupta didn't say where he got his number from. Gcabashe says she finds it strange that he would take a call from someone he doesn't know. Mbalula: We take calls from anybody, even your nemesis... even Afriforum calls I would take. Mbalula says there was a fall out over his candidature for the Mangaung conference. Gcabashe: If we move beyond August 2011, when next did you raise the issue (about Guptas)? Mbalula says they had many meetings. He says he was the first person to raise the issue of the Guptas in the NEC. He says people found their voices. Gcabashe asks if Mbalula never had an opportunity to influence the SG to place this issue back on the agenda, since Zuma didn't respond. Gcabashe asking what steps did he take against the Gupta issue & their influence on the ANC since it bothered him so much (beyond August 2011) when next did you raise this issue? Asked if he discuss this matter before the meeting - he says they did, it happened when Ajay Gupta called him, he was in the presence of a comrade & it reinforced that, these things happen.